Win a $75 gift certificate toward a wall decal purchase from WiseDecor Decorative Lettering, which you can use to write encouraging Bible verses on your home’s walls. God gives us the privilege of parenthood and His Spirit guides us to show our children how to give His love to others. We begin by showing His love to them, which comes quite naturally from the time He’s knitting them in mama’s womb. One way to express this beautiful message in their earliest years is with WiseDecor’s Floral Life Verse design, which lets you customize it right on their website, choosing among a selection of life-affirming verses. Young boys can be a joy and a challenge to raise. They have a raw energy that, given a solid example and lots of patience from loving parents, can be powerfully used by God for His purposes. WiseDecor believes that Christ-likeness is best achieved by focusing on Christ Himself. That’s why they recently created a design based on Luke 2:52, which can be a simple way to point your son toward Christ’s character. them out and start assembling a photo collage with them — one that spans from past generations to the present. 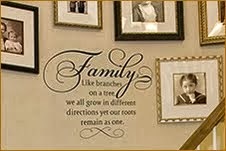 WiseDecor has beautiful wall decals for effectively captioning a photo collage. that inherently helps your family to remember their heritage, which can lead to a virtuous cycle of respect and honor. To enter the give-away complete one or more of the options below. The winner will be picked October 26th. The winner will be contacted via email and given a gift certificate code worth $75 which can be used to purchase any item on WiseDecor. I'd love to win some scripture wall decor! These are such an awesome way to dress up a wall 🙂 Getting ready to move in December would love one to put in the new house! I would so love to win this. Scripture wall décor is one of my requests for Christmas from my family. I'm not on pinterest or twitter. Is it worth it to try to win when I can only get points for being a fan of a Facebook page? Vinyl decals for walls make it easy to decorate any space. People often use wall decals because they capture themes that are important to the people who live in a particular space. 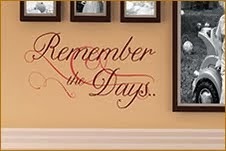 Wall decals are easy to blend with any decorating theme. People who live in apartments can find the right match for their tastes without much hassle.